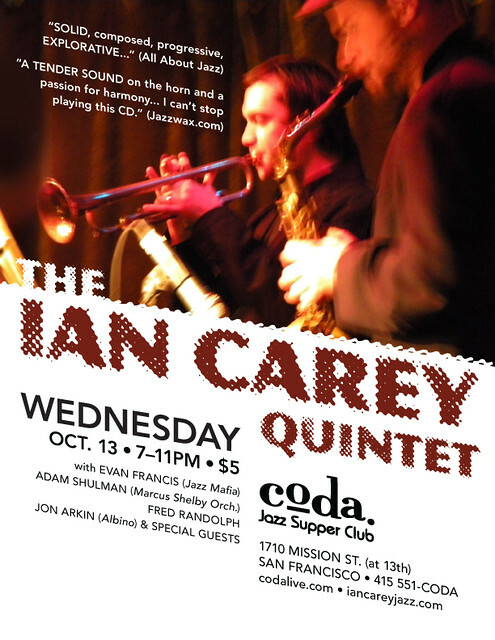 Trumpeter Ian Carey and his quintet will be playing at Coda in San Francisco on Wednesday, 10/13 from 7-11pm. Go see live music!!! This entry was posted on Monday, October 11th, 2010 at 11:42 am. It is filed under Music News/Info and tagged with Coda, Ian Carey Quintet, jazz, live music, San Francisco. You can follow any responses to this entry through the RSS 2.0 feed.